This quotation from Isaiah 6:9-10 does not express a desire that some would not understand, but simply states the sad truth that those who are not willing to receive Jesus’ message will find the truth hidden from them. Jesus spoke in parables because of the spiritual dullness of the people, and He compares His preaching in parables to the ministry of Isaiah, which, while it gained some disciples (see Isaiah 8:16), it also exposed the hard-hearted resistance of the many to God’s warning and appeal. God does not want anyone to perish (see 1 Timothy 2:3-4 and 2 Peter 3:9). After a casual reading of the sixteen verses that make up the Parable of the Sheep and Goats (Matthew 25:31-46), it seems that they suggest that salvation is the result of good works. The people compared to the sheep were the ones that acted in charity in giving to the needy food, drink, and clothing, who exhibited hospitality, and who visited the sick and those in prison. The goats seem to have done nothing in regard to these things. This resulted in salvation for the sheep and damnation for the goats. The casual reading seems to make it very clear and concise that salvation comes from good works. However, this is clearly not the meaning of the Parable of the Sheep and Goats. All Scripture proves itself right and non-contradictory when compared with the totality of Scripture. This is what is referred to in 2 Timothy 2:15 as “rightly dividing the word of truth.” Scripture does not contradict Scripture, and the Bible clearly and repeatedly teaches that salvation is by faith through the grace and mercy of God and not by good works (see John 1:12, Acts 15:11, Romans 3:22-24, Romans 4:4-8, Romans 7:24-25, Romans 8:12, Galatians 3:6-9, and Ephesians 2:8-10, to mention a few). A closer examination of the Parable of the Sheep and Goats reveals much, much more. In the very first verse of the parable, Matthew immediately establishes the kingship and authority of Christ by using the title that Christ so often used in identifying Himself: the “Son of Man” (see John 5:27 and Daniel 7:13-14). The sheep are placed at His right hand. This is a place of honor and shows that the sheep are esteemed by Christ. Compare this with Matthew 22:64; Luke 22:69; Acts 7:55 and Hebrews 1:13; where Christ is at the right hand of the Father. The goats are placed on the left. Testimony is given, judgment is made, and reward and punishment are the result. There are many things in these verses that could be examined in depth and at length. We could look at whether or not this is part of the “Great White Throne Judgment,” the “judgment of the dead” mentioned in Revelation 20:11, or the judgment of those who survived the “Great Tribulation” and are still alive at the return of Christ. We could look at who the “brethren” are, referred to in vv. 40 and 45. Does this parable have to do with the treatment of Israel by the other nations of the world? We could look at the doctrines of predestination or election prompted by verse 34, or the question of the eternality of hell referred to in verse 46. While the examination of these issues is certainly worthwhile, none of them pertain to what is the main thrust of the Parable of the Sheep and Goats. What is God trying to reveal to us in these verses? Note that both of the groups represented by the Sheep and the Goats were not aware of their actions in relation to the judgment conferred upon them, and both asked, “When did we do these things?” And this question, in itself, is very revealing as to the condition of the heart of those involved. In these verses we are looking at man redeemed and saved, and man condemned and lost. Salvation takes place at the moment we receive Jesus Christ, by grace through faith, as our Savior. In this giving of ourselves, we become children of God (see John 1:12-13). Second Corinthians 5:17 tells us that “if anyone is in Christ he is a new creation, the old has gone, the new has come.” But what is it, exactly, that makes us a “new creation.” We are still in this flesh (see Romans 7:14-25), we are still in this world (see James 4:4), and, have no doubt, we are still sinners (see 1 John 1:8). The change or transformation that takes place in us at the moment of conversion is due to the fact that we are sealed by God in the person of the Holy Spirit (see Ephesians 1:13-14), resulting in salvation. Salvation means that we are brought to the place where we are able to receive something from Christ, namely, forgiveness of sins (see Acts 26:17-18). Our sin debt to God is then cancelled by the atoning death of Christ on the cross, who, at salvation, becomes our Lord. He paid the price for our sin since we could not (see 1 Corinthians 6:19-20 and Hebrews 10:27-28). From this moment on, when the Father looks at us, He chooses to see His Son indwelling us by the Spirit as opposed to seeing our own sinful flesh, and it is only in this manner that our works become acceptable to Him. These works are not being offered by our sinful flesh, but by the power of the Spirit that resides in us. At salvation our duty as Christians is to become disciples of Christ. Our duty is to become like Him (see Romans 8:29; 2 Corinthians 3:18; and Colossians 2:6-7). Galatians 5:22 tells us that the fruit of the Spirit is love, joy, peace, patience, kindness, goodness, gentleness, faithfulness, and self control. These are the traits that Jesus Christ exhibited throughout His life, and a Christian will grow in this fruit in direct proportion to the cooperation that he gives the Holy Spirit working in his life. Good works in a Christian’s life are the direct overflow of these traits, and are only acceptable to God because of the relationship that exists between servant and Master, the saved and their Lord, the sheep and their Shepherd (see Ephesians 2:10). So, the core message of the Parable of the Sheep and Goats is that good works will result from our relationship to the Shepherd, to Christ. Followers of Christ will produce good works, will treat others with kindness, will deal with others as if they were Christ. Those who reject Christ live in the opposite manner. While “goats” can indeed do acts of kindness and charity, their hearts are not truly in them for the right purpose – to honor and worship God. The practical message of the Parable of the Sheep and Goats is, just where, exactly, do you stand in relation to the Shepherd? Are you a sheep or a goat, saved or lost? Until you come to the place in your life that you find yourself among the sheep, until you are saved by faith, through the grace and mercy of God, you will never find true and lasting peace with God. God made us for Himself, and our hearts will be restless until we find our rest in Him. Consider the Parable of the Sheep and Goats. What is the condition of your heart? Remember, “He is no fool who gives away what he cannot keep, to gain that which he cannot lose” (Jim Elliott). 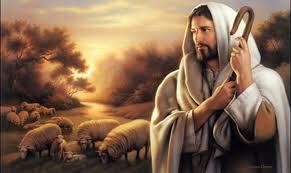 Make your decision to dwell with the sheep under the care of the Shepherd, by the grace of God, with the love of Jesus. This entry was posted in Discipleship and tagged Christ, Christ Jesus, Christianity, Epistle to the Romans, God, Gospel of Luke, Gospel of Matthew, Isaiah, Jesu, Jesus Christ, Luke, Matthew, New Testament, Timothy. Bookmark the permalink.